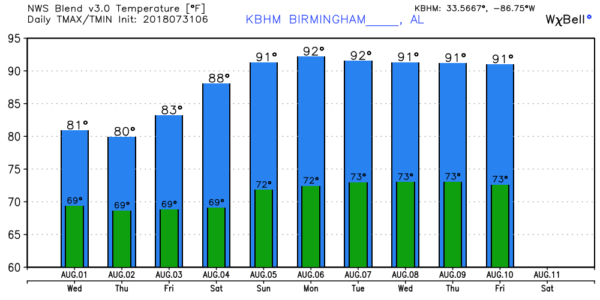 Brian Peters sees rain, lower temps in Alabama’s near future from Alabama NewsCenter on Vimeo. HERE COMES THE RAIN AGAIN: A variety of clouds cover Alabama this morning as dew points have risen into the lower 70s again after a nice break in the humidity for several days. The upper trough that has been forecast to dig into the Lower Mississippi River Valley is doing just that. Radar showed a nice batch of showers and storms over Louisiana extending into eastern Texas. As the upper trough gets closer today, you can expect to see the radar screens blossom with more showers and storms. Clouds and numerous storms should help to hold the highs today in the middle 80s. The Storm Prediction Center does have a marginal risk for severe storms today that stretches across much of Alabama. The main threat will be isolated storms producing damaging wind gusts and perhaps some hail, with the greatest risk coming during maximum daytime heating. REST OF THE WEEK: For the next several days into Friday, we should remain in an unsettled weather pattern with reasonably high probabilities for showers and storms – as in 60 to 70 percent chances. 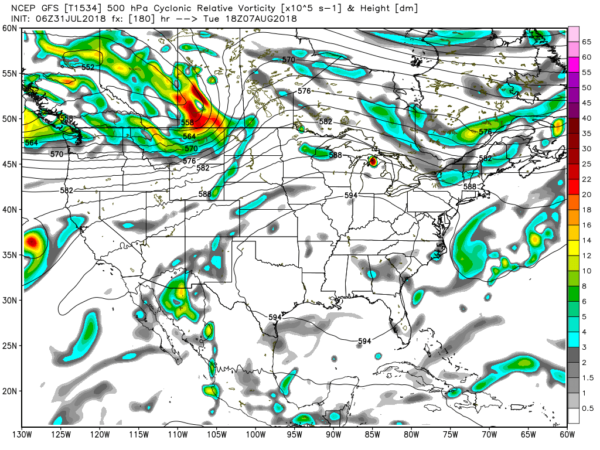 The main reason will be the meandering of the upper trough over the Lower Mississippi River Valley. This also keeps us in somewhat cooler air, with highs mainly in the 80s and lows around 70. Changes begin to come about Saturday as the Bermuda High pushes into the Southeast from the east. The high becomes established over the Southeast into early next week. This should mean showers and storms become more scattered. Unfortunately, our daytime highs will increase, with readings moving into the lower 90s again. Given the projected strength of the upper ridge, we might see highs pushing into the middle 90s. We’ll need to watch heat indices, since humidity levels will remain fairly high. LONG TERM: Looking out into voodoo country, the Global Forecast System is again bullish on an upper ridge over the eastern U.S.; however, it looks like we may miss the worst of the heat. The GFS keeps an area of slightly lower pressure over the Gulf Coast region, which could mean a continuation of numerous showers and storms. These storms and the increased cloudiness could hold daily highs into the lower half of the 90s, still not bad for August. TROPICS: All remains quiet across the Atlantic basin; tropical storm formation is not expected for the next several days. SPANN AWAY: We are on a one-a-day schedule for the week as James Spann enjoys some time off.